If you find yourself somewhere in Italy and want to make you way across to Dubrovnik you have several options of doing this. The fastest way of reaching Dubrovnik from Italy would be to fly. However, the majority of flights only operate during the summer months. Dubrovnik has air connections with Rome, Milan and Venice. Both, Croatia Airlines and Vueling has flights between Dubrovnik and Rome during summer months. Volotea offers flights from Dubrovnik to Venice, Milan and Bari. The city of Milan is connected by EasyJet flight with Dubrovnik. Dubrovnik is connected by a ferry line with the port of Bari in the southern Italy. This route is run by Croatian ferry company Jadrolinija. Service is only seasonal - operating from May until the end of October. This is overnight ferry and sailing journey takes approximately 10 hours. 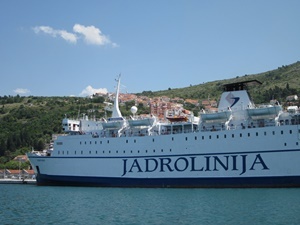 This ferry is the only international ferry connection from Dubrovnik. If you are travelling off the season you can reach the port of Ancona and take the ferry from there to Split which runs all year round. The port of Split is situated 4 hours car ride from the city of Dubrovnik. Many travellers wonder if there is a boat connection between Dubrovnik and Venice. Unfortunatelly, there is no such connection. The most convenient way of doing this journey is to take a flight between these popular travel destinations. 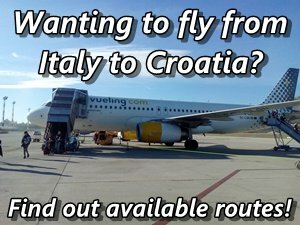 Travellers can choose from Croatia Airlines, Volotea or EasyJet flights. Venice to Dubrovnik flight takes around 1 hour 15 minutes but it's only available during the summer season. There is also an option of taking catamaran crossing from Venice to one of Istrian ports and continue further by bus. Note that this journey is pretty long - 10 hours.